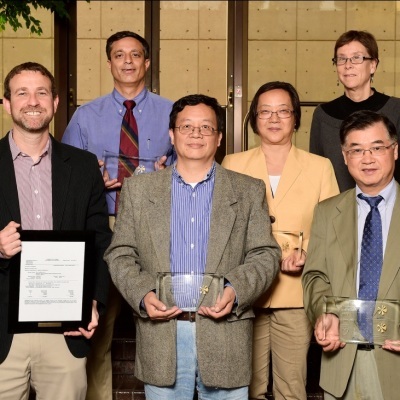 Winship members, Hui Mao, PhD, Adam Marcus, PhD and Lilly Yang, MD, PhD are recipients of the 2015 Emory 1% Award. The honor recognizes Emory faculty whose National Institutes of Health (NIH) proposals have been ranked in the top 1% by NIH reviewers. Emory University School of Medicine postdoctoral fellow, Ruiting Lin, PhD, is one of three honored with the Emory University School of Medicine Postdoctoral Award. Dr. Lin is mentored by Winship investigator, Jing Chen, PhD. Pictured: Department of Hematology and Medical Oncology Interim Chair, Amelia Langston, MD with some of the Winship award recipients including Sagar Lonial, MD, Adam Marcus, PhD, Shi-Yong Sun, PhD, Georgia Chen, PhD and Dong Moon Shin, MD. View full list of MilliPub Club members. View full list of Emory 1% Award recipients.